I had an email yesterday from Debbie Smith. She wanted some advice on dealing with a couple of her pet hates; swans and spiders. They’re spoiling her enjoyment of the canals and everything on them. I’m sure that she’s not on her own, so here’s her question and my suggestions. “This is going to sound very ridiculous and I risk being viewed as a right wimp. I would very much welcome advice on how to deal with swans who seem to take delight tormenting me with my phobia of them by refusing to budge when I need to pass by on a very narrow section of towpath! I’ve tried bribery with bread, and speaking very nicely (whilst muttering dark threats under my breath and trying to look cool) but they are not impressed. 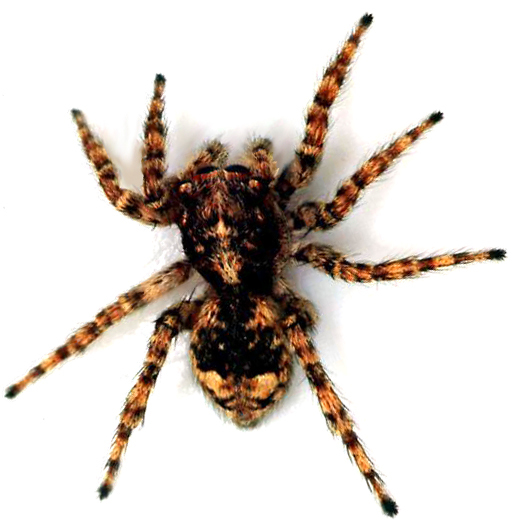 Also – even more of an anxiety, apart from horse- chestnut spray, is there anything I can do to try to dissuade the big hairy type house spiders from inviting themselves on board. (I wouldn’t kill them despite loathing the very sight of them). Apart from these two fears I am quite rational and sane. Rats, mice and snakes are no problem – oh yeah – maybe wasps give me the heebie jeebies but I can cope with them. Swans first. They can be fearsome creatures, so I can understand Debbie’s anxiety. A full-grown male can reach almost 30lb in weight and have a wingspan of nearly eight feet. A cobb (male) puffing up his chest, hissing and spreading his wings to protect his pen (female) and their young brood can be quite scary. But swans, as with most creatures, just want a quiet life. They only present an aggressive front when they feel threatened. I have to get very close to our resident breeding pair in my day-to-day duties as a groundsman. They are most protective, and therefore aggressive during their April – June breeding season. As the cygnets increase in size and become less vulnerable, the adults relax more. It IS possible though to coexist with swans at all times if you just apply a little common sense. Swans feel very threatened by dogs. If you have a dog that is likely to chase the swans, make sure that it is kept on a short leash. A barking dog will also increase the swan’s agitation, so try to calm your dog. I have two spaniels. They have only recently come to live with me at the marina. Their first visit here was their first experience of swans. They’re spaniels, they’re inquisitive, and the swans didn’t like it. There was much hissing, wing flapping and a bit of barking too. But Charlie and Daisy aren’t aggressive dogs. They quickly learned not to go too close to the swans. The swans soon accepted them and now both dogs and swans live in harmony. Charlie and Daisy can sniff through the reeds to their heart’s content just ten feet away from the sunbathing adults and their young with no problem at all. 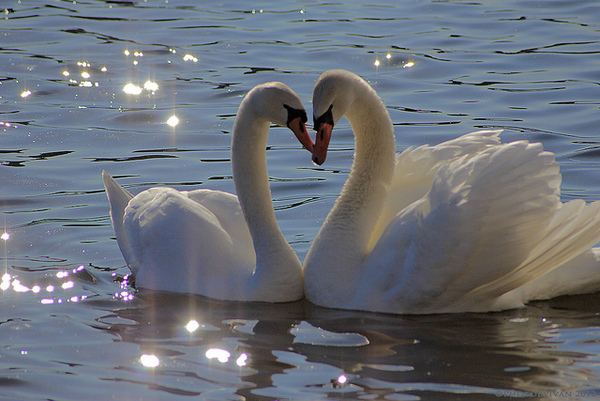 I have learned to live in harmony with swans too. The secret is to take things slowly. Sudden moves alarm all animals. Swans are no exception. If you walk rapidly towards them, they will become defensive and aggressive. If you walk towards them slowly, they will simply move away. At the marina, the swans like to relax on the grass. Two adult swans and six half-grown cygnets laying on the ground make grass cutting a bit of a challenge. There’s a simple solution though. I just move towards them slowly with the mower. If they become agitated, I stop for a moment. When they settle down, I move forward again. They no longer feel threatened, just uncomfortable so they waddle out of the way and slip into the water. It’s also possible to decrease the birds’ agitation by decreasing your height. If you squat down, you are less intimidating to the swans. I don’t have a problem with spiders now but I did when I first moved on board I did. They were everywhere. Of course the boat was infested with spiders because it had been unoccupied for years. They had a free rein and had made themselves very comfortable. Now I don’t have any more problems with spiders than I would if I was living in a house. Spider webs appear from time to time but not enough to be considered a problem. So why did I have a problem then and don’t have a problem now? I think there are two reasons. Firstly, the boat is now cleaned very regularly; far more now that Sally is on board full time. Spiders simply don’t get a chance to establish themselves. Whenever a web, or traces of a web, appears, it is dusted into oblivion. As James is all wood panelling inside, there’s a fair amount of furniture polish used inside the boat. I don’t think the spiders like it. There’s also less opportunity for them to get in these days. In November 2011 I had the existing masonite cabin overplated with steel. The masonite (oil treated ply) was 35 years old and way past its effective life. The two side hatches and the rear hatch were constructed out of deckboard which had warped. The gaps between hatches and doors was large enough to fit my finger so presented no barrier at all for the largest spider. The roof was in five sections. The four roof joints had moved apart and subsequently been taped over with what looked like duct tape. The tape had split on every joint to allow insects – and the weather – easy access. Many of the windows leaked too. The gaps between window frame and cabin again allowed easy access for insects. The new 4mm steel roof, cabin sides, forward and rear bulkheads, hatches and doors have both weatherproofed the boat and provided a deterrent for insects. I spent three weeks painting James in April 2012. There are now five lovingly applied coats of paint to protect the steel. I paid particular attention to the window frames. All the frames are now leak free. They are spider-access free too. Some spiders do manage to sneak on board though so what do I do to get rid of them? Not much to be honest. I would rather have a dozen spiders than a single fly. Disgusting disease ridden little blighters. The more spiders there are to keep the flies down the happier I am. Maybe you don’t feel the same way though so what can you do to discourage spiders from settling? Conkers. Good old horse chestnuts. The things that school children used to thread om strings and spend endless hours trying to destroy before the gods of the Health and Safety Executive banned such a dangerous activity. Spiders don’t like conkers. Collect horse chestnuts in the autumn then place them next to doors and windows to keep spiders at bay. That’s the theory anyway. Boat and bricks and mortar home owners swear by their effectiveness. There doesn’t appear to be any hard evidence to back up their claims. The Royal Society for Chemistry (RSC) launched an investigation in 2009 to find out if there was any scientific evidence to substantiate the old wives’ tale. You can read a report here. Whether there’s evidence or not to support the effectiveness of conkers, their use certainly won’t do any harm. Nor will ensuring that your boat is dusted and polished regularly and that window and door frames are as gap-free as possible. Swans and spiders are a part of everyday life on a narrowboat. There’s much that you can do to minimise your contact with them or to ensure that your experiences with them are as problem free as possible. Don’t let spider and swan phobias spoil your enjoyment of life on the water.